Honda is canine-conscious and they’re proving it with a new dog-friendly car that has mutts drooling and wagging their tails worldwide. 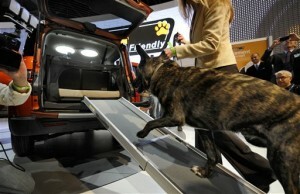 The Japanese automaker exhibited a “Dog Friendly” version of the Honda Element SUV at the New York International Auto Show on Thursday. The concept features a cushioned pet bed with safety restraints in the cargo area, a spill-resistant water bowl, and even a ventilation fan to keep canines comfortable. A folding ramp gives animals an easy way to get in and out. In the back seat, there’s an integrated pet carrier and machine-washable seat covers to make it convenient and safe to carry smaller pets. The rubber floor mats feature a toy-bone pattern, and paw-print emblems on the side and back of the vehicle draw attention to its pet-friendly status. It’s a sage move by Honda, because dog owners are loyal– just like their pooches–so if they like this car, they’ll undoubtedly become ambassadors for the vehicle. Nothing sells like word-of-mouth and dog people talk–I mean, bark–a lot! As a dog owner myself, I applaud the new vehicle designed with pets in mind, especially the washable seat covers and folding ramp. My two dogs have thrashed the backseat of my M35 to the point where it needs to be re-upholstered, so seat covers that you can wash is a great idea. And I’ve often wished I had a ramp, because getting my mutts in and out of the vehicle can be troublesome at times. I have to pick up my smaller dog and he’s a biter, so a ramp would be nice. Honda says it’s still finalizing the features, but the Dog Friendly Element will be available this fall. Lose Your Job—No Problem! Just Give the Hyundai Back!